Sophos Safeguard Encryption encrypts user data. With the encryption on a machine, the user data will be protected. Sophos Safeguard provides both Full Disk Encryption as well as File Encryption. Disconnect the encrypted hard drive from the affected machine. Connect the encrypted hard drive to the computer where you want to access the content of the hard drive. Use USB hard drive docking station or USB hard drive connecter. Open my computer and you will find the red key sign/icon for the attached hard drive which tells that the drive is encrypted but the key is not available. In order to find which key was used, right click on the drive and select Properties. Open the Encryption tab, you will find the unique KEY ID for that hard drive. Open the SafeGuard Management Center software and then find the user that should gain access to the files on the slave hard drive. In this case I will pick the logged in user on the computer where the slave drive is attached. Click the Key Symbol as shown in the picture. A new search window will appear. 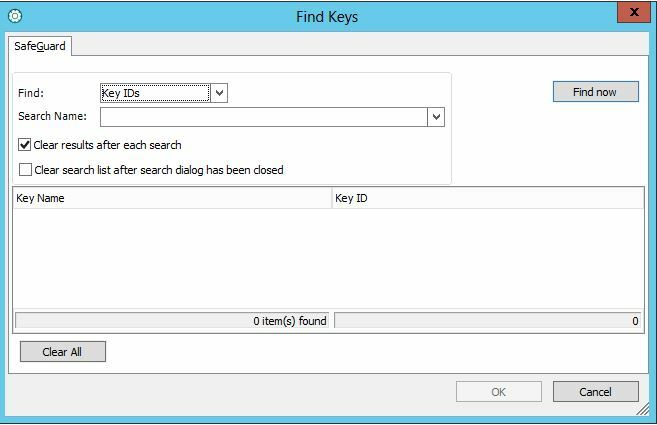 Switch to Key-ID in the Find field and search for a key with its Unique ID found in step 1 or step 2. Start typing the key in the search name field. Since all the KEY ID’s are unique it should be sufficient to search for the first few characters. The key will show up. By double clicking on the key name it will now be assigned to the user and show up in the key tab. After attaching the key to the user, hit the save button to implement the changes. Reboot the computer where slave hard drive is attached and log in with the user in step 3. You can access the content of the slave hard drive as a normal hard drive.